Whenever I walk around my neighbourhood, visit friends, a park or almost anywhere, as soon as I get the slightest hint of that distinctive smell of meat being cooked over charcoal, I’m in a trance. A sort of ‘BBQ trance’ – if there is such a thing. BBQ smells + meat + charcoal = An Argentine asado (BBQ). Of course, chances are living in a vibrant multicultural city that same charcoal smell could be coming from any other type of BBQ. The point is, barbequing, of any type evokes the same images and memories for me. That classic Argentine BBQ. Huge and long strips of succulent beef ribs, whole chickens, beef skirt, juicy steaks, offal and more all grilling away in harmony over a charcoal grill. My earliest BBQ memories were of my dad, when he’d make them at home usually on a Sunday afternoon. In fact, one of the best BBQ meals I’ve ever had (and still remember to this day), was one that he’d made on the spur of the moment. I even remember the year, it was 1999. As I got older, I began to experiment making my own BBQs. I didn’t want them to be hit or miss. I wanted to hit the mark every time. What was driving me? Some call it an obsession; others (a little nicer) call it a passion. But I say it’s a little bit of both. 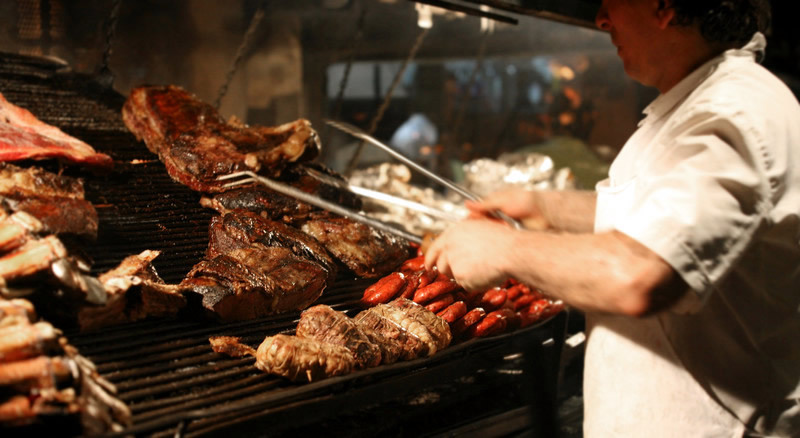 Anyone who’s travelled or lived in Argentina would know that barbecuing and eating meat is a national obsession. I love that many cultures embrace the same passion to barbecuing as we Argentinians do. Europeans, both North and other South Americans love to BBQ, as do Aussies and New Zealanders, even most Asian cultures love to BBQ. Each country has their own unique flavours, styles and BBQs. tasting BBQs you have tried, then come to El Carnivoro BBQ and let’s share the BBQ passion together. I hope you can enjoy my Argentine BBQ. El Carnivoro Argentinian BBQ aims to introduce students to the world of the traditional Argentine BBQ and impart the skills and knowledge on this unique style of grilling various cuts of meat and vegetables and help build the confidence for those wanting to impress with their next Argentine BBQ (asado). The student will gain the confidence and the know how to cook a BBQ that is not common in Australia, whilst using a traditional Argentine BBQ grill. They will also benefit from new BBQ recipes to try at home, how to plan the next BBQ when cooking for a small or large group, learn the tricks to managing that Argentine BBQ from set up to ‘let’s sit down and eat’. Classes are held in a private residence with cover, utilising a custom made traditional Argentinian BBQ grill*. The class is a combination of part observation and student participation. After the cooking demonstration students are invited to sit down for lunch and enjoy the day’s cooking in a relaxed and casual atmosphere. There will also be an opportunity for students to take home a sample of recipes made on the day, as well as their own booklet with instructions on how to make their own Argentine BBQ. *NB In the event of extreme high temperature, which results in a Total Fire Ban the class will be cancelled. Students will be notified and given the option of a full refund or reschedule class.